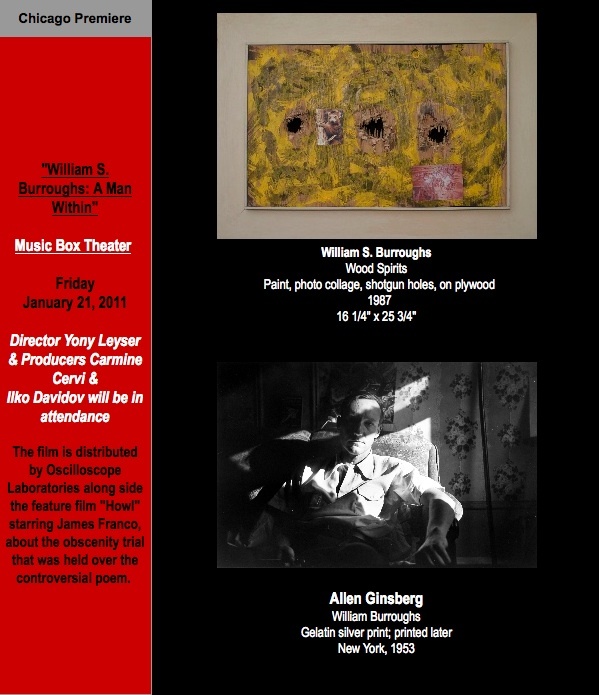 Featuring a live performance of Ginsberg’s seminal poem, “Howl”, and attendance by director Yony Leyser & Producers Carmine Cervi & Ilko Davidov of “William S. Burroughs: A Man Within”. RSVP at 773.252.8672 ext. 305 or thinkartsalon@gmail.com. Allen Ginsberg’s photographic work on display provides a rare glimpse into a generation of free expression and rebellious thinkers from the 1950’s, including candid snapshots of his friends William S. Burroughs, Neal Cassady, and Jack Kerouac, as well as self-portraits. William S. Burroughs’ works on paper and shotgun paintings push the artistic boundaries paralleling the spirit of both of their written work (bio).